Yeah, but: Imagine if they were actually designed for the PCM-D50. The Long Version: As part of my never-ending quest for expensive hobbies, I've decided to take up audio recording. 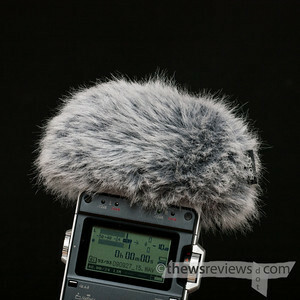 After months researching portable field recorders, mostly spent on other people's review blogs, I chose the Sony PCM-D50. You will never, ever find a review of this excellent field recorder here - it's been done and there's nothing that I can add. I can only direct people to a few of the sites that helped me: Brad Linder, Transom, O'Reilly, Wingfield, Future Music, and F7 Sound. What I can do is fill in a little bit of information about the accessories. 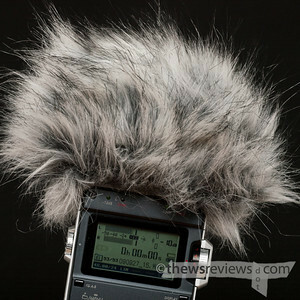 The Sony D50 is equipped with a pair of condenser microphones, so it's very sensitive to wind noise. Some sort of windjammer is mandatory, but Sony doesn't include one in the box. Their recommended screen is the ADPCM1, and as its name suggests, it's also/originally for the $2000 PCM-D1. It has mid-length fur that's neatly trimmed, and the D50 still squeezes inside the fancy Sony flip case with it in place. My biggest complaint about the screen is that, despite being hard to put on, it has a very loose fit. I have no doubt that one day it will run away from home. I've already dropped it on the sidewalk a couple of times, and even the addition of some ponytail-elastics hasn't really helped. Since I'm sure that I'll lose the Sony windscreen eventually, it seemed prudent to preemptively order its replacement. 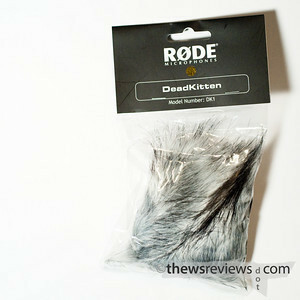 I had read on a forum that the Rode 'Dead Kitten' would fit the PCM-D50, so that was the one that I picked. (RØDE, for what it's worth, is Australian.) It has a taller and boxy design that's intended to go over the NT4 and Stereo VideoMic, but it has a very strong and narrow elastic cuff that holds snugly around the D50's roll cage. 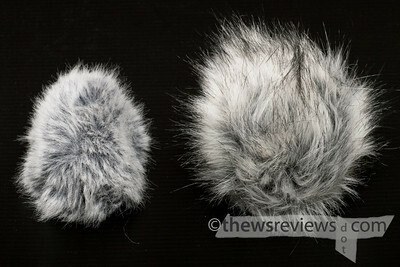 Its fur is also much longer and floofier than the Sony windscreen, making it look like the D50 is having a lot more fun. The elastic on the Kitten is so strong that when it's off of the recorder it rolls into a little ball, and it can be hard to find the opening. It also has sides, with one flap that's longer than the others. With that put at the back, the -12 and 0dB LEDs on the D50 are somewhat visible, but mine will still get a slight haircut to help that out. And yes, I did include this photo just in case anyone thought I was being funny with the 'Dead Kitten' name. Did I mention that Rode is Australian? I wanted a simple way to compare the performance of the different windshields, so lacking any better ideas, I set up an oscillating fan. I've read somewhere that a fan doesn't provide a realistic test, since its steady output doesn't match the force or variability of real wind, but it was the best I could do for repeatable and consistent conditions. I set the recorder up about one foot from the fan and one foot from the ground, and positioned it so that it was catching the fan on one end of its travels. Even if it's not scientific in its rigour, the results do seem indicative of real-world performance. 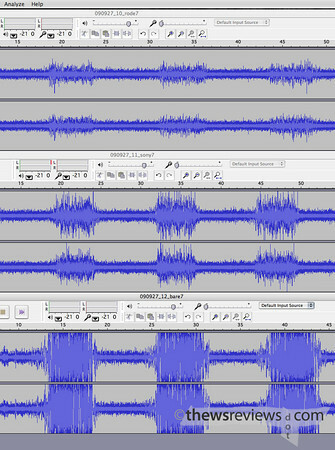 These are Audacity's audio waveforms from the original 48KHz/24-bit .wav files for the Dead Kitten, Sony windscreen, and the bare nekkid PCM-D50. The mics were set to XY stereo, the gain was set to 7, and the low-cut filter was off. I set the levels so that the Sony windscreen was barely clipping, hitting +03dB, which the D50's fancy limiter handles with ease. The Rode peaked at about -3dB at the same position and settings; for the screenless recorder that was enough to cause serious hard clipping, which is the first time I've ever actually heard it with the D50. (A gain setting of '2' stopped the wind noise from clipping, and completely removed the sound of the pesky fan.) With the screens, the sound of the gears is audible underneath the hum of the blades, and with the Dead Kitten it can be heard even when the full force of the fan is hitting it. You can click on these links to listen to the mp3 versions of the files. They're each 25 seconds long, start two seconds before the first pass of the fan, and end five seconds after the second pass. You'll want to turn the volume down for the last one. I have a habit of being very conciliatory in my comparison conclusions, and this isn't going to be an exception. The Dead Kitten is clearly the more effective windscreen, but at the expense of a slight overall reduction in sound levels. That's not a big deal, since the PCM-D50 has plenty of gain to spare, but the larger hairdo makes it very difficult to fit into its fancy case (sold separately). So I'm striking a compromise: dedicated recording sessions will use a tripod and the Rode screen, and the Sony windscreen is the one to use when I'm just carrying the D50 around in its case. ...at least until I lose it. Awesome review! I love how the Rode is $25 and does a job twice as good as the twice as expensive $50 Sony muff. I'm getting me twin dead kittens!